March 2019, Mayflex the distributor of Converged IP Solutions is sponsoring the VIP lounge area at The Security Event, being held at the NEC in Birmingham. 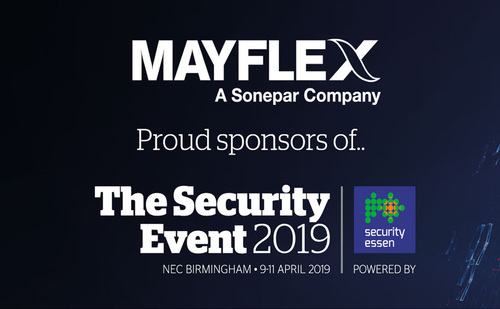 The Security Event is a major new exhibition created for the commercial and residential security market and is taking place on the 9th – 11th April. This free to attend event brings together a world-class education programme of seminars and workshops, market leading brands and industry experts. Make an appointment to visit Mayflex at the event by emailing admin@mayflex.com. Register with Mayflex to attend the event and you will automatically be upgraded to VIP status. This press release was distributed by ResponseSource Press Release Wire on behalf of Mayflex UK Limited in the following categories: Manufacturing, Engineering & Energy, Computing & Telecoms, Construction & Property, for more information visit https://pressreleasewire.responsesource.com/about.